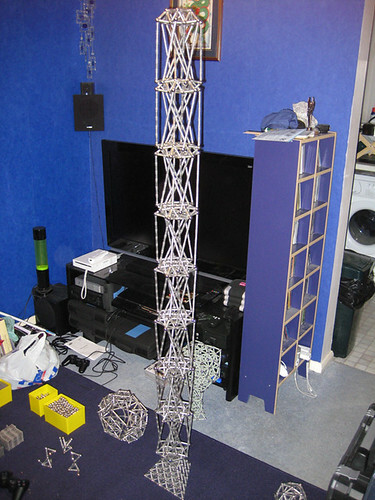 How does one build the highest possible tower with the smallest number of geomag pieces? My attempt in the attached pictures was relatively stable. Earlier I had built a higher tower with a single tetrahelix (see the discussion on that topic), which held up only very precariously, in part because I could make it stand only approximately vertical. Would I have succeeded better if I had paid attention to the orientation of the magnets (which I disregarded entirely)? What are your experiences? What about you collectors with thousands of pieces: how high did you ever get? I've had a couple of attempts at towers using a module I came up with. And again using "double scale"